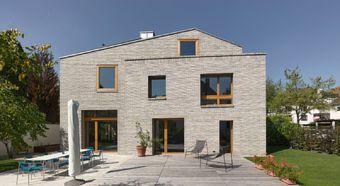 Inspired by the corner plot in North Schwabing, the appeal of this single-family house is in its specially created roof shape with two gables over the corner and a bay window towards the crossroads. 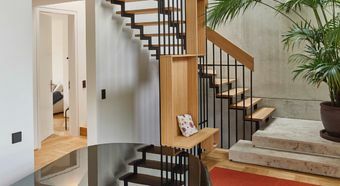 An exposed concrete wall divides the villa into a two-floor and a three-floor section. 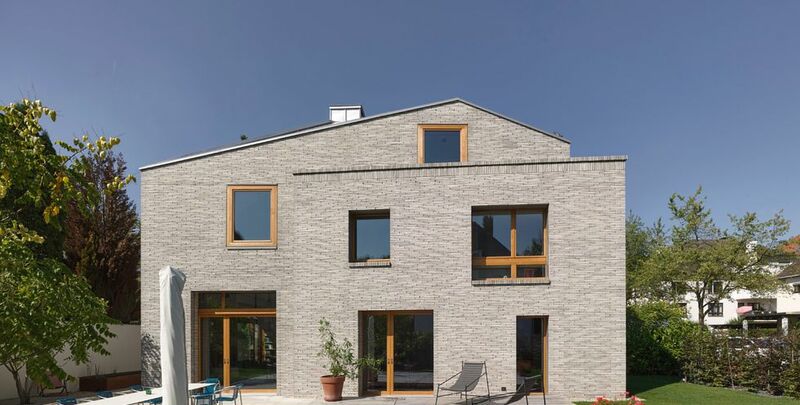 The façade of this single-family house consists of smoothed-off brickwork. 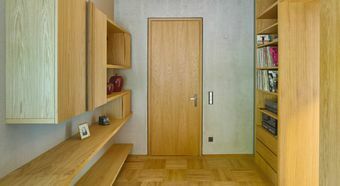 The Munich architect, Katrin Hootz, particularly draws our attention to the windows. 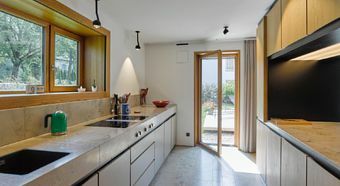 Depending on the interior aspect, they are located a little deeper in the building or flush with distinctive frames in the façade, so the wide windowsill can be used as a seating area. 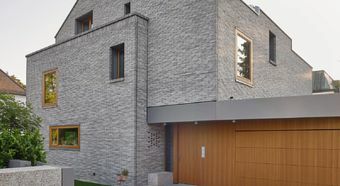 The window frames are made of oak and – along with the house entrance and garage door – they provide a contrast to the grey brickwork façade. The canopy and the metal garage door draw attention to the mix of materials out of brick, wood and metal. 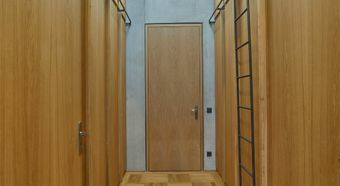 Selected top-quality materials are also used in the interior spaces. 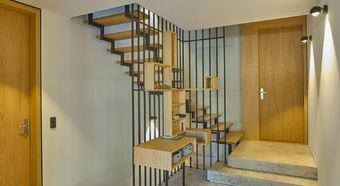 The floor, the open-rung staircase and the built-in furniture are made distinctive with oak. Jura marble is featured in the entrance area, the staircase, the kitchen and in the bathrooms. Black steel and linen in the curtains and in the wallpaper round off the interior design concept. The villa is equipped with electrical installations from JUNG. The smart KNX solutions combine the aspects of convenience, security and energy efficiency. 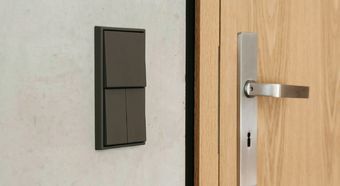 The residents can operate the lighting individually or in pre-set scenes with the F 50 KNX push-button sensors. 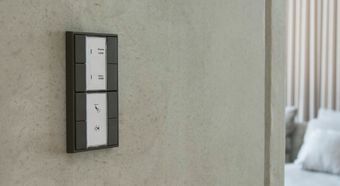 The entire electrical installations are kept in the classic LS 990 switch design in Les Couleurs® Le Corbusier. The switches are painted in a special process by hand. This produces the matt surface. The 63 Les Couleurs® Le Corbusier colours are exclusively available worldwide through JUNG.